This dataset provides atmospheric carbon dioxide (CO2), methane (CH4), carbon monoxide (CO), molecular hydrogen (H2), nitrous oxide (N2O), sulfur hexafluoride (SF6), and other trace gas mole fractions (i.e. "concentrations") from airborne campaigns over North America for the NASA Atmospheric Carbon and Transport - America (ACT-America) project. ACT-America's mission spans five years and includes five six-week field campaigns covering all four seasons and three regions of the central and eastern United States. Two instrumented aircraft platforms, the NASA Langley Beechcraft B200 King Air and the NASA Goddard Space Flight Center's C-130 Hercules, are used to collect high-quality in situ measurements across a variety of continental surfaces and atmospheric conditions. The data were derived from laboratory measurements of whole air samples collected by Programmable Flask Packages (PFP) onboard the two ACT-America aircraft. There are a total of 312 files in this dataset. There are 156 data files in NetCDF (*.nc) file format and 156 data files in ICARTT (*.ict) file format. Note that files in both formats contain the same atmospheric gas concentration data but the ICARTT files contain no aircraft navigation and meteorological data. 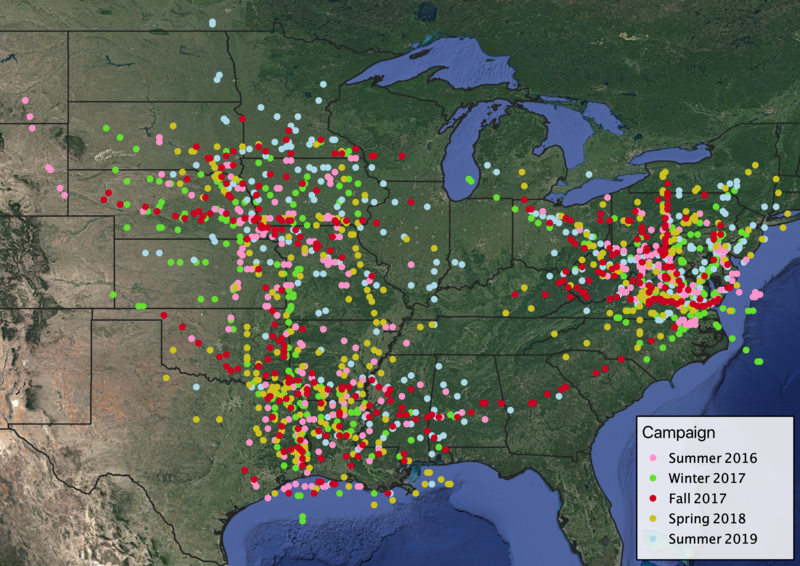 Figure 1: Locations of ACT-America flask air samples from flights during the Summer 2016 (blue) and Winter 2017 (red) campaigns. 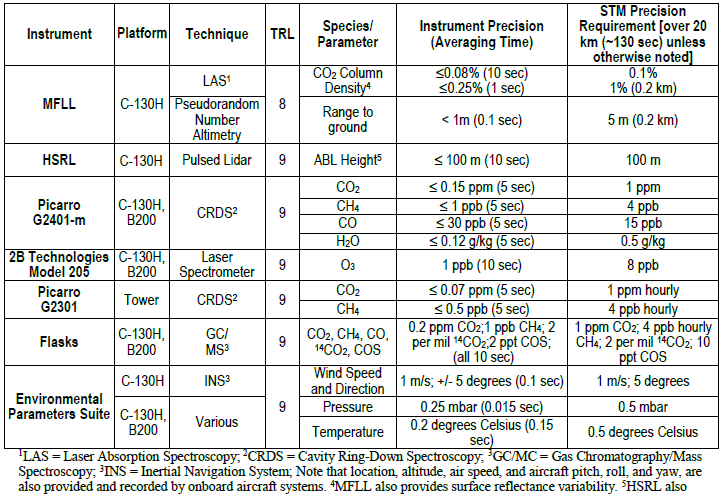 Temporal Resolution: Approximately 10-12 flask samples were captured during each flight. There are 156 data files in netCDF (*.nc) version 4 format following CF conventions 1.6. 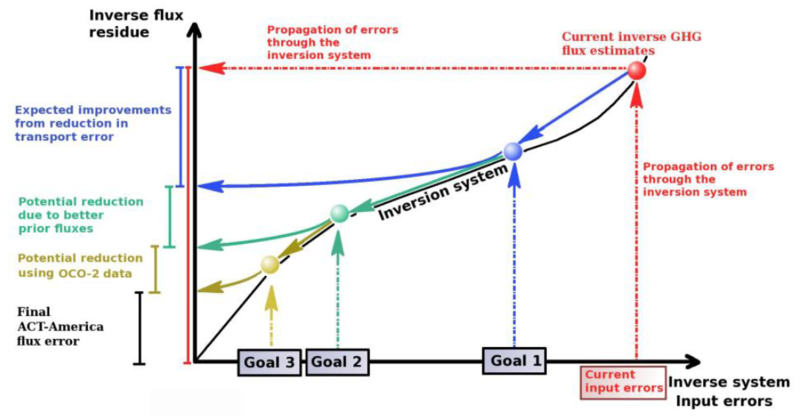 NetCDF files are structured as GeoTrajectory files, where the observations for a flight segment are connected along a one-dimensional track in space, with time increasing monotonically along the track. These files contain gas concentrations and data from the respective aircraft’s flight navigation system. The flight and altitude data were imported from the ACT-America P3-B Data System (for B200 flights) and Housekeeping data (for C130 flights). There are 156 data files in the ICARTT file format (*.ict). ICARTT files have detailed header information and follow the standards established and summarized in the ICARTT File Format Standards V1.1. https://www-air.larc.nasa.gov/missions/etc/IcarttDataFormat.htm. The files contain the same atmospheric gas concentration data as the NetCDF files, without the additional navigational or meteorological information. ACT-America deployed high-quality, field-tested trace gas and meteorological instruments. 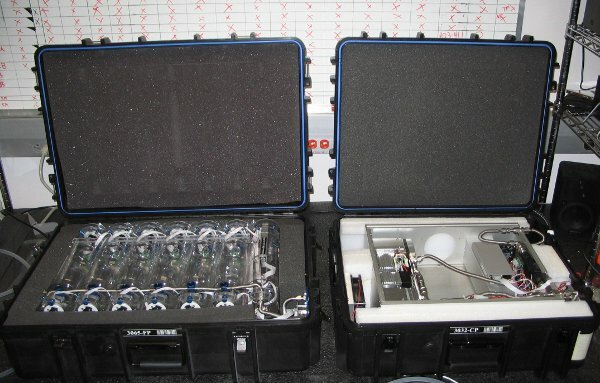 This dataset includes measurements from discrete air samples captured by the flask sampling system onboard the aircraft. The two air-sampling devices, the Programmable Flask Package (PFP) and Programmable Compressor Package (PCP) systems, are used routinely on aircraft as part of the NOAA/ESRL Greenhouse Gas Reference network (Sweeney et al., 2015). Version 1.1 (released 2019-03-27) updated all PFP data from the Summer 2016 and Winter 2017 campaigns and added the Fall 2017 and Spring 2018 campaign data. Version 1.0 (released 2018-06-26) provided the PFP data from Summer 2016 and Winter 2017 campaigns.